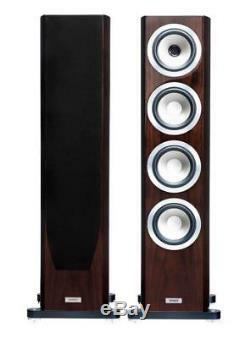 TANNOY PRECISION 6.4 - High Gloss Walnut Floor standing speakers. For full-scale music and movie reproduction with life-like dynamics, the Precision 6.4 is the flagship floor-standing loudspeaker in the Precision range. This grand design combines the detailed imaging and communication of the new 150 mm (6") Precision Dual Concentric driver with the low frequency extension of the matching 150 mm (6") bass driver in a large volume cabinet for deeper bass reproduction. The substantial cabinet is loaded with a pair of Auxiliary Bass Radiators (ABRs), positioned above and below the active bass driver, to deliver deeper and smoother LF response. The Precision range combines Tannoys 85 years of loudspeaker design experience with modern high tolerance manufacturing to deliver outstanding accuracy and musical articulation. This luxury loudspeaker range is based on a new 150 mm (6) version of Tannoys world-renowned Dual Concentric driver with WideBand tweeter technology. Delivering exceptional bandwidth with extremely low colouration this innovative point source driver ensures faithful reproduction of the source information. Precision cabinets are truly unique, mixing acoustic engineering and aesthetic beauty in equal measure. The curved side panels reduce internal standing waves, reduce panel resonances and increase cabinet volume while ensuring even the largest Precision models have a discreet look and compact footprint. The design is enhanced by the finest attention to detail, from the luxurious finishes to the CNC-machined plinth components. On the inside, precision engineering and precision performance is the root of this loudspeaker ranges name. For the cabinet, heavyweight fibreboard construction, unique architecture, complex bracing, Tannoys proprietary Differential Material Technology (DMT) and a Mass Loading Cavity (MLC) draw heavily on Tannoys rich heritage in loudspeaker design. Precision crossovers are hand-built and hard wired from the finest components. From the real wood veneers and deep gloss lacquer finishes to the aluminium trims and unobtrusive branding, the Precision range boasts premium design and finish throughout. Subtle dark-weave grilles with sub-surface magnetic fixings ensure a smooth, contemporary look with the grilles on or off. Flat front and rear baffles coupled with curved side panels reduce internal reflections and brace the cabinet structure. A Mass Loading Cavity (MLC) has been engineered into the cabinets of the flagship floor-standing Precision models. The MLC offers user-specified bass tuning by filling or part filling the sealed cavity with dry mineral aggregates or dedicated loudspeaker ballast materials. Depending on room acoustics and flooring construction loading the MLC can improve low frequency timing information and enhance stereo imaging. Precision floor-standing models are supplied with custom plinths designed to stabilise the loudspeaker and improve ground coupling. Each plinth incorporates Tannoys easy-to-adjust floor spikes. Each metal bodied turret is mounted through the plinth, allowing the spike height to be adjusted from above. A large CNC machined thumb wheel locks the spike in place for maximum rigidity. Dedicated spike cups are supplied to protect polished or marble floors. The 150 mm (6") Precision Dual Concentric represents the latest iteration of the technology and Tannoys most articulate and powerful 150mm (6") Dual Concentric driver to date. The Precision Dual Concentric features Tannoys latest 25 mm (1) titanium dome HF driver featuring WideBand technology and the Companys signature Tulip WaveGuide. The mid/low frequency cone is an ultra-rigid multi-fibre pulp material with a rubber roll surround, giving the most natural communication through the key mid-band frequencies. A powerful double magnet bass motor system is used to enhance the focus of the magnetic field in the voice coil gap, giving the driver high sensitivity and outstanding dynamic range. In Precision floor-standing and centre channel models the Dual Concentric driver is augmented by active bass drivers and/or Auxiliary Bass Radiators (ABRs) depending on model. The Precision bass driver uses the same multi-fibre cone and double magnet system as the DC unit to ensure seamless low frequency extension. Precision ABRs offer high-compliance / low-loss cabinet loading for exceptionally tight and focused bass. Using ABRs eliminates the port turbulence possible at high volumes with large cabinet loudspeakers and the distributed positioning above and below the main DC driver (Precision 6.4) delivers the smoothest LF response. Power with precision; the Tannoy Precision 6.4 speakers have it all. Dual Concentric drive units Once again, Tannoy has made use of its famous Dual Concentric drive units. With the tweeter in the throat of the main woofer, the Precision 6.4 gives a single point source for high and mid-range frequencies giving a consistency and realism of vocals. The tweeter itself is a titanium dome unit that gives exceptional detail without sounding brash or harsh. The WideBand technology ensures exceptional frequency response, while Tulip WaveGuide mounting gives holographic-like precision. Double-magnet woofers The woofers feature double magnets. Featuring on both of the powered woofers in each cabinet, these double magnets provide a faster and more dynamic bass response. With its secondary powered woofer, the Precision 6.4 is also equally capable as a home cinema front or high power stereo speaker. Twin Auxiliary Bass Radiators (ABRs) In addition to the two active woofer units, the Precision 6.4 also features twin ABRs. These enhance the speakers' efficiency by using air movement inside the cabinet. Although not actively powered, the energy within the cabinets is used to underpin the bass, meaning a low frequency response of just 29Hz can be achieved. What's more, the high 90dB sensitivity means that you don't need a high power amplifier to achieve a powerful and dynamic sound. Unique crossover The Precision range comes with a unique 5-point crossover. As well as bi-wiring from 4 of the connections, a fifth connection acts as an earth to your amplifier, reducing RF interference for a more focused sound. Rather than using a PCB, there are hard-wired crossovers for low signal losses, and audiophile-grade capacitors in the high frequency feed and low-loss laminated core inductors for the low frequencies. The internal wiring is silver-plated high purity oxygen-free copper too. The upshot of this is as little resistance as possible, giving you greater clarity and purer detail. Mass loaded cavity The base of this speaker features a sealed cavity for mass loading. Use dry sand or dedicated filler to fill or part fill the cavity for an improvement in bass response. Generally, mass loading the speakers will create a more solid, tuneful bass response. Luxurious cabinet design The Tannoy Precision range uses skillfully designed cabinets with bowed side panels, a shape that helps reduce internal standing waves, so producing a cleaner, less boxy sound. As you'd expect from Tannoy, the finish is exceptional, too. The lustrous gloss black finish gives these speakers a high-end look and marks them out for attention in any room. Dedicated plinths The Tannoy Precision 6.4 speakers have stabilising plinths, which offer a stable and rigid support. This reduces detail loss via cabinet resonance, so the sound is clearer, more detailed and benefits from a'faster' sound. A further benefit of the plinths is the ability to adjust the spikes from the top, for ease of leveling and adjustment. For a powerful speaker that's equally adept with music or home cinema, the Tannoy Precision 6.4 offers super-sized clarity. The item "PAIR FLOOR STANDING SPEAKERS TANNOY PRECISION 6.4 BRAND NEW WARRANTY HG WALNUT" is in sale since Sunday, July 22, 2018. This item is in the category "Sound & Vision\Home Audio & HiFi Separates\Speakers & Subwoofers". The seller is "hifiexperience" and is located in F - D - GB - I - NL DETAILS IN SHIPPING.